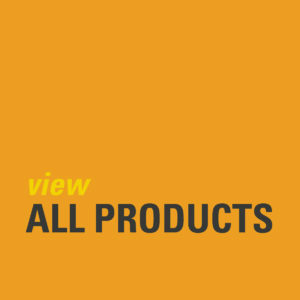 Click on the process to expand the section or view the benefits of ECM industrial furnaces here. Carburizing is a thermochemical treatment which consists in enriching a layer of material in carbon at the part’s periphery, and to then make an abrupt cooling or quenching. It is called low pressure or under vacuum in order to highlight the absence of air and therefore of oxygen during the process. 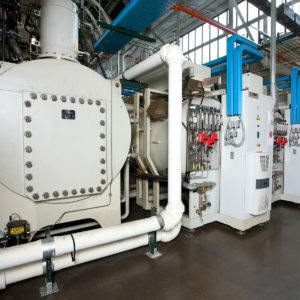 In low pressure, the efficiency of introducing nitrogen in the materials is proved when ammonia is introduced into the combustion chamber during certain stages of intermediate and final diffusion. The NH3 partial pressure is the same when carburizing. The number and length of carbonitriding steps depend on the depth and the concentration of nitrogen desired under the surface. The process temperature can reach 1760°F [960°C] and is much higher than atmospheric carbonitriding. This allows deep diffusion of nitrogen – up to 1 mm – and nitrogen levels on the surface of up to 0.6%, with much shorter time cycles. The gases produced by cracking are burned downstream of the pumping unit in order to meet environmental standards. CNBP offers undeniable resistance gains to gearing strain. It has been demonstrated that, in the case of transmission pinions, the combination of CNBP and staged gas quenching during the martensitic phase 356°F [180°C]-392°F [200°C]-STOP-QUENCH- produced strain resistance gains of about 30%, as shown by the Woelher curves regarding low pressure carburizing followed by direct gas quenching. This method is very promising for future development of high torque transmissions. A gas quenching cell is a mechanism under pressure, which allows a load to be cooled at different speeds and pressures (up to 20 bar absolute). This cell was designed to quench either with nitrogen or helium with remarkable cooling efficiency and uniformity. Gas cooling is performed with two water/gas heat exchangers located on each side of the load. The water flow and temperature determine the exchanger cooling power and thus the load’s cooling rate. The gas flow, usually nitrogen, is performed by two mixed-flow turbines, located on either side of the load. The large diameter design of these turbines is crucial to optimize the gas velocity and the power of the engines. The power of each engine is 250KW for nitrogen and 130KW for helium. Gas direction is variable – either from top to bottom or bottom to top – thanks to an ingenious system of lateral shells moving with a set of 2 cylinders in 1 second. The advantage of this alternating flow is to offer the possibility to reduce the thermal gradients between the top and bottom of the load, and therefore, improving the hardness tolerance and distortion. The programming of this alternating flow is specific to each recipe. The gas quenching cell is an enclosed area under pressure, which allows a load to be cooled at different rates and at different pressures (up to 20 bar absolute). The load is cooled from top to bottom. It is carried out by using two water/gas heat exchangers located on each side of the load. The water and temperature flow process the cooling power of exchangers and thus the cooling rate of the load. The nitrogen gas flow is performed by two 130 KWatts axial turbines, located above the load, in the upper part of the cell. The turbine concept is crucial to optimize the gas velocity and the power of the engines. The quenching speed during quenching can be modulated and adjusted by changing the turbine speed quench pressure. 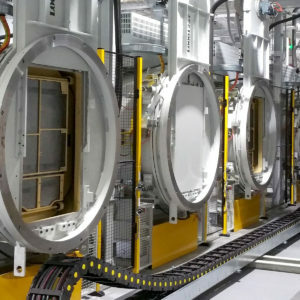 Over time, improvements were made in chamber design to even cell cooling: turbine blades, grid flow distribution, supply and exchanger surfaces etc. Gas quenching is a cooling process focused on quality. 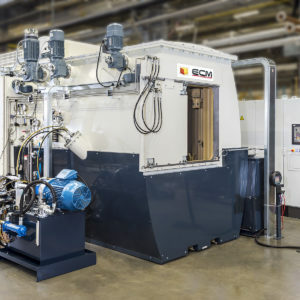 More than 80% of ECM Technologies’™ European and North American clients have adopted gas quenching. ECM Technologies devotes great efforts in R&D to optimize this technology. Gas quenching is a cleaner process and therefore easy to integrate. The gas quenching parameters can be precisely adjusted to provide a substantial improvement in quality. 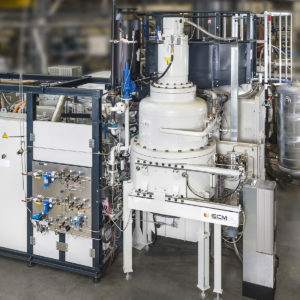 This cell works under vacuum or under partial nitrogen pressure, thus ensuring the absence of oxidation on the surface of the low pressure carburized parts. It has an internal lift and two level positioning: Quenching and dewatering / loading unloading. The oil, vigorously stirred by two immersed hydraulic brewers, can handle large loads thus limiting calefaction phenomena. The layout of these brewers is different depending on the tray version. The oil cooling is ensured by a continuous water/oil or air/oil exchanger group depending on the operating temperature. Installation of the quench tank requires the construction of a waterproof and airtight tank. Optional, if the parts are to undergo intermediate machining before the oil quenching, accelerated load cooling with 1 bar nitrogen can be achieved with a turbine located in the upper part of the quenching tank. The nitrogen is cooled using an internal water/gas heat exchanger.